You have to love the ever-changing nature of modern art. The form shows no signs of slowing down as more and more artists begin to explore new areas in the field. The amalgam of two art forms can be quite beautiful as well. 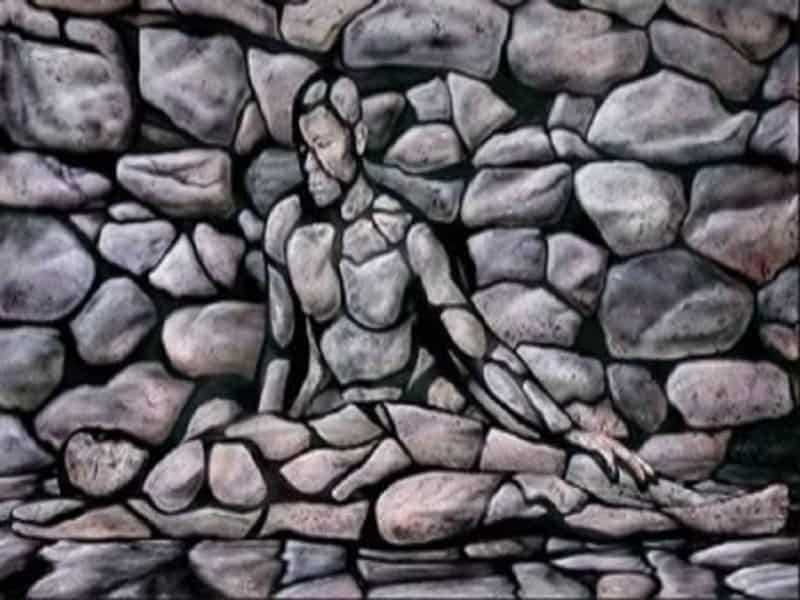 One kind of amalgam is the art created using body art and contortion. This can be striking, as the lines between reality and fantasy begin to merge seamlessly. 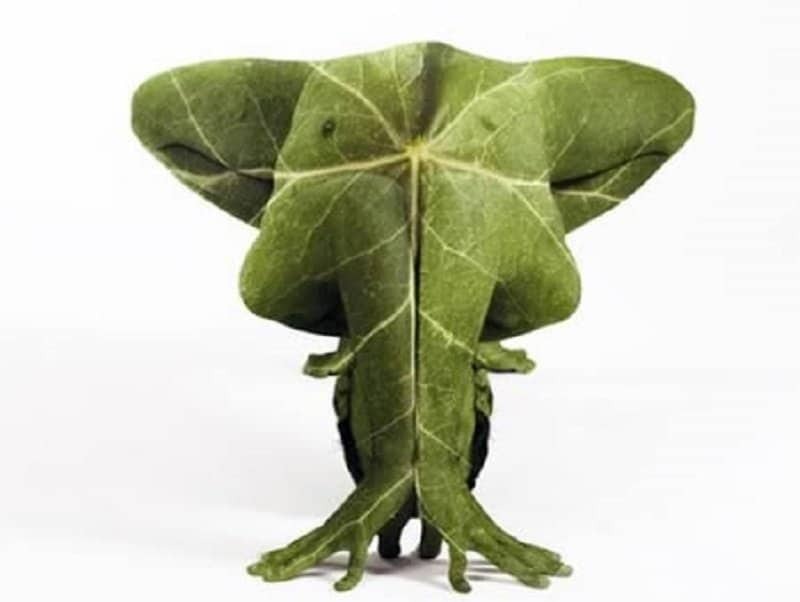 Here is a list of 10 beautiful pieces created using body art and contortion. This piece was made by artist Guido Daniele from Soverato. He uses model and body art to create various pieces that are used primarily for advertising. Craig Tracy is an artist from New Orleans who is famous for his body painting work. He spends hours creating the perfect colors and textures in order to create a unique and complex optical illusion. This interesting piece was created by Andy Golub. He used four women and an aerial view to create an extremely psychedelic piece. This amazing piece was created by artist Gesine Marwedel. 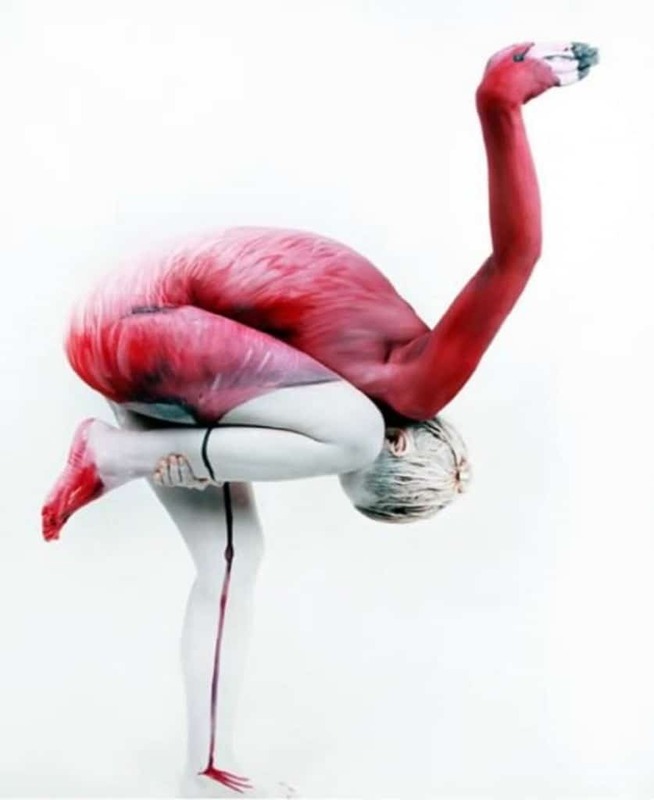 The model strikes a unique pose which the artist uses to construct the shape and form of pink flamingo. This piece used multiple people and amazing contortions to create a piece that looks like a green elephant. The shape and texture of this piece is truly amazing. 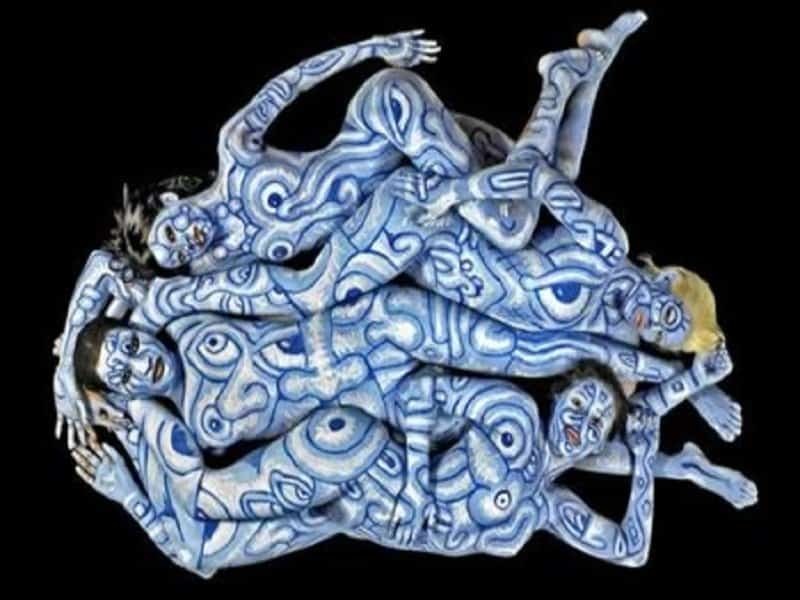 This amazing illusion was created by artist Trina Merry, who used multiple naked athletes as the structure for the bike. The model riding in the bike is sitting in the perfect postion to compete the illusion. This rather unique piece was also created by artist Andy Golub. He purposely used full-bodied people to create a unique canvas, and then painted quite a psychedelic piece over it. 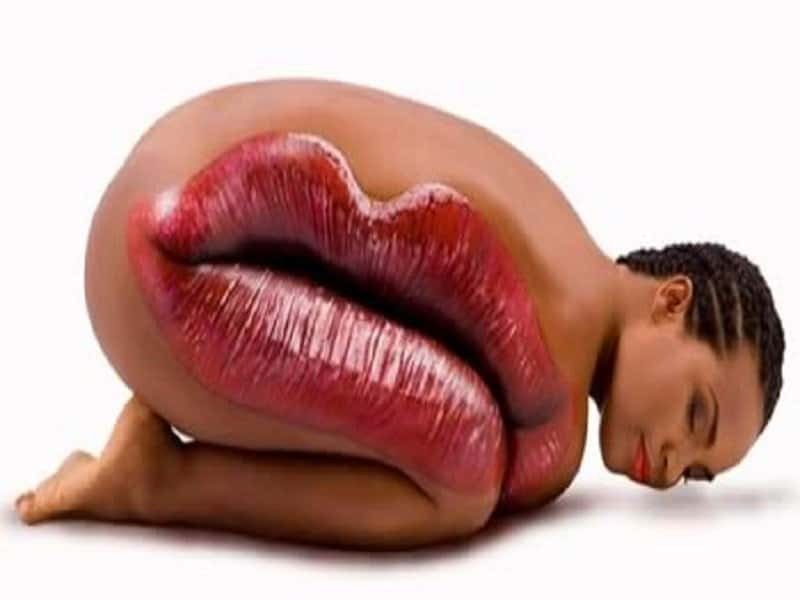 This body art-contortion amalgam was actually made by an ad agency called i.d.e.a for one of their clients. This series was created by artists Chadwick and Spector. They use the human form to recreate a set of lost, stolen, unknown or destroyed paintings to raise awareness about these works of art. 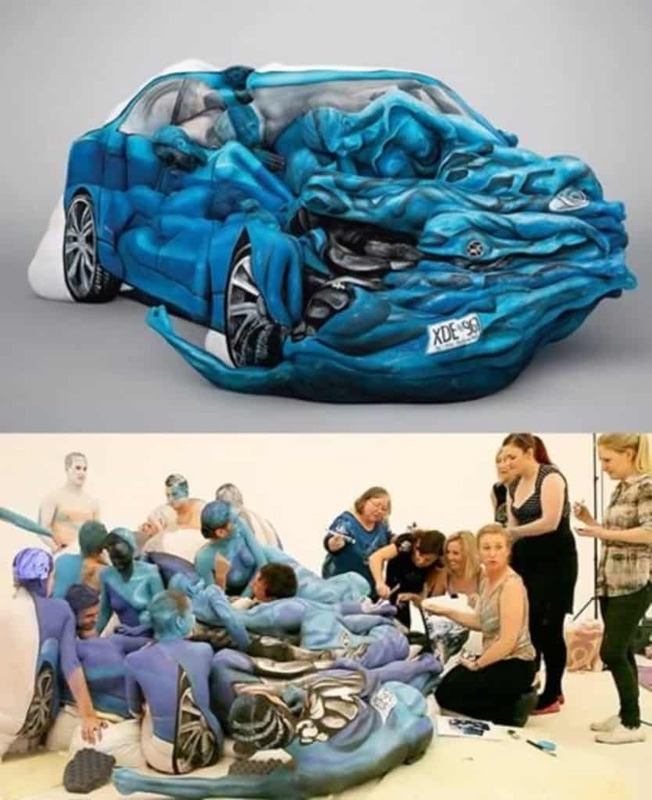 This intricate piece was created by artist Emma Hack who used a team of dedicated models to create the shocking illusion of a car crash. The various limbs of the models create a believable texture for the part of the car that has a huge dent.